no McDonald’s and no KFC. There’s a lovely moment towards the end of the half-hour ferry crossing from Ibiza to Formentera when the captain kills the engine and Platja de Ses Illetas eases into view. The beach, which hugs one side of the Trucador peninsula, is a long swath of dazzling white sand backed by rolling dunes, but it’s the colour of the sea that draws a collective intake of breath among the passengers. The deep cobalt and turquoise shallows are so vivid that they look Photoshopped, almost unworldly. The island of Formentera is small (only 32 square miles, so easy to get around by rented bike or moped), mostly flat, arid and sparsely populated. A Cinderella to big sister Ibiza, it struggled to survive for centuries on fishing and salt panning, periodically besieged by pirates, until in the 1960s it was discovered by hippies and the occasional passing rock musician, among them Bob Dylan and members of Pink Floyd. 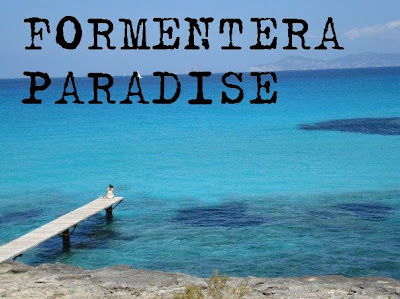 But Formentera still refuses to be harried into the 21st century. Its planning laws are some of the strictest in Europe: not only does the island have no airport —and no plans to build one, thanks very much — it also has no high-rise buildings, no shopping malls, no water parks (sorry, kids), no McDonald’s and no KFC. The beaches are the main attraction, with their powdery sand, translucent water and a famously relaxed attitude to the wearing — or not wearing — of swimsuits. At Illetas, the only buildings are the original 1960s chiringuitos (beach bars) some of which have been converted into chic, and rather expensive, toes-in-the-sand restaurants. In recent years the dunes have been roped off to encourage the regrowth of wild flowers, with wooden boardwalks built across them so that visitors can stroll from one bay to the next. Although the Gecko Beach Club describes itself as family-friendly, a better place to stay with children is the Hotel Cala Saona, which overlooks a secluded cove and has a pool (built before the current planning regulations came into force), a children’s playground and tennis court. The hotel opened in the 1950s with just two rooms and became a secret bolt hole for Prince Rainier and Princess Grace of Monaco, who would arrive by yacht. A series of photographs in the hotel library shows how the building and the surrounding bay have changed in the intervening years. Remarkably, it looks much the same today as it did in the late 1970s. From Cala Saona I hiked along a coastal path that veered dangerously close to the edge of the sandstone cliffs, gazing out towards the mystical island of Es Vedra off the southern tip of Ibiza. The sunsets there were sensational. On another day I joined a kayak safari, paddling along the shoreline to explore the many caves and rock formations. To cool off, we dived into the limpid waters. If you were to keep paddling, or walking, you would eventually reach the Cap de Barbaria, an eerily beautiful and desolate spot with a working lighthouse and an 18th-century watchtower atop a rocky promontory (I took the soft option, by rental car available from any of the usual car hire companies in Spain). The views were heart-stopping, both out to sea and down beneath my feet, where peregrine falcons swooped and swirled above the rocks. I found the sleepy village of Es Pilar de la Mola, the other end of the island from the blink-and-you’ll-miss-it capital of Sant Francesc Xavier, was worth a visit — its twice-weekly hippy craft market sells goods of surprisingly good quality, many times better than its counterpart on Ibiza. Es Pilar de la Mola is also home to one of the island’s best restaurants, Pequeña Isla, where I enjoyed local specialities, including ensalada payesa, made of twice-baked bread, dried fish, tomatoes, pepper, olives, oil and vinegar. My other favourite was pastel de patata — white cheese and pesto grilled on sliced potato. The only resort on the island is Es Pujols, where you’ll find low-rise apartment blocks and a few tourist shops selling inflatable crocodiles. But even here there is plenty to celebrate. Enter the warren of back alleys and you will find some delightful bars, restaurants and boutiques, while along the beachfront is a row of varaderos, the traditional shelters built by Balearic fishermen from driftwood to house their boats, which are still passed down from one generation to the next. According to locals, some canny fishermen were recently given a hefty sum in compensation by the EU when their varaderos were destroyed in a storm. Having pocketed the cash, they simply rebuilt the shacks using the newly available driftwood. All roads lead back to the Trucador peninsula, a narrowing sand spit that extends from the north of the island towards Ibiza. On the west side is Platja de Ses Illetas, the pristine beach first glimpsed by arriving ferry passengers, its sugary sand lapped by gentle waves. And if you want an even more private spot, stroll across the peninsula to Platja de Llevant, where the water is so flat and clear that it resembles a vast infinity pool. The best beaches in the Mediterranean? I think so.